The skin of an eggplant is quite bitter and can ruin the whole dish. Be sure to take a few extra minutes to peel your eggplant before slicing it. Eggplant is packed with water. To make it fry up crisp, you want to draw some of the water out. To do that, you want to “sweat” the eggplant. That means you will slice it and salt each side, very generously. After just a few minutes, you will notice beads of “sweat” on the slices. That is the moisture being drawn out. After about 30 minutes, rinse the slices with water, pat dry, and they’re ready to get dressed for the frying pan! Nothing quite makes my mouth water like freshly fried eggplant. Especially when there is a pot of homemade marinara close by. Heat the oil in a large Dutch oven over medium-high heat. Add the onion and cook until soft. Add the garlic and red pepper flakes and cook for 1 minute. Add the red peppers and cook for 1 minute. Add the tomatoes, bring to a boil and cook, stirring occasionally, until thickened, about 25 to 30 minutes. Emulsify with a hand blender and process until smooth. Add the parsley, basil and oregano and season with salt and pepper. Cook for 10 minutes longer and season with sugar to cut the acidity. Preheat the oven to 400 degrees F. Lightly spray the bottom and sides of a 15 by 10 by 2-inch baking dishwith olive oil and set aside. Place the bread crumbs into a large shallow bowl. Add the herbs, 1 1/2 teaspoons salt and 1/2 teaspoon of pepper. In another medium shallow bowl, whisk the eggs and 2 tablespoons of water together. Dredge each eggplant slice in the flour, tapping off excess, then dip it in the egg, and finally dredge it in the bread crumb mixture. 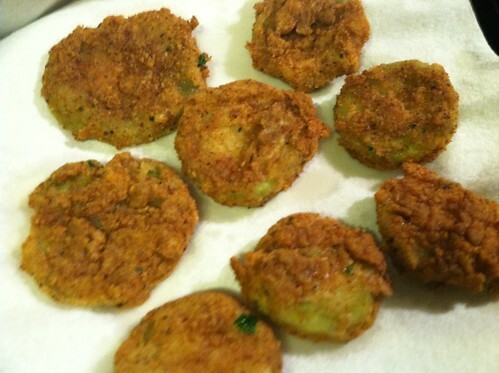 Shake off any excess breading and transfer the egg plant to a baking sheet. Repeat with the remaining eggplant. Heat 1/2-inch of oil in a large straight-sided saute pans over medium heat . Working in small batches, fry a few of the eggplant slices, turning once, until golden brown, about 3 minutes per batch. Using tongs, transfer to a paper towel-lined baking sheet. Repeat with the remaining eggplant. Cover the bottom of the prepared baking dish with some of the tomato sauce and arrange 1/2 of the eggplant over the sauce. Cover the eggplant with some of the sauce, grated mozzarella, fontina, Romano cheese and fresh basil. Repeat to make 3 layers ending with the sauce. Bake for 20 minutes, until sauce is bubbling. Top with the fresh mozzarella and remaining Romano and bake another 10 minutes, until hot and just beginning to brown. Let rest 10 minutes before serving, slice and serve! I’m really loving cooking vegetarian on Mondays. The challenge of eating meat-free one day a week, has me researching tasty entrees I probably wouldn’t try usually. This tortellini dish literally blew us away. I had my vegetarian friend over for dinner and she was also impressed. I must say, the Georgia Olive Farms Olive Oil really made this dish. It melded beautifully with the sharp bite of fresh garlic, the herbed pasta and the creamy goat cheese. This recipe should probably serve four, but Jim and I ate 3/4 of it between the two of us. The only thing that would have made it any better, would be a fresh loaf of french bread to sop up the delicious sauce left at the bottom of the bowl. 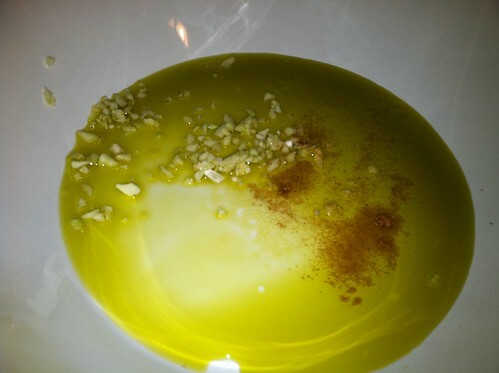 Isn’t that olive oil beautiful? In a covered pot, bring well-salted water to a boil over high heat. In a large pasta serving bowl, combine the olive oil, garlic, cayenne, and 1/2 tsp. salt. 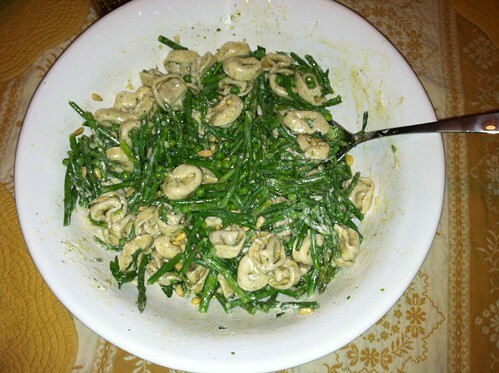 Cook the tortellini, asparagus, and peas in the boiling water until the tortellini is al dente, about 3 minutes. 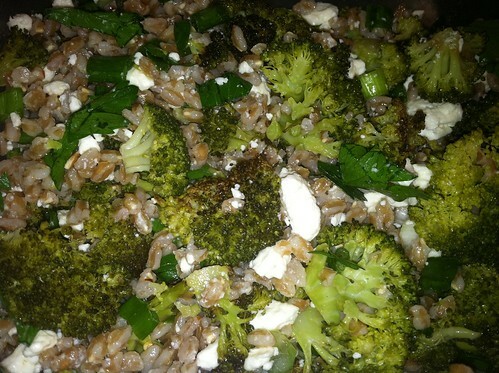 Reserve 1 cup of the cooking water, then drain the pasta and vegetables and toss with the garlic-oil mixture. Add the pine nuts, mint, and goat cheese and stir until the cheese melts into a sauce, adding cooking water as needed to moisten the pasta. Season to taste with salt, pepper and parmesan and serve. This bowl was not full for long.